Quietly nestled in the Shenandoah valley in the foothills of the George Washington National Forest, near the river, overlooking the area’s historic railway, this secluded cabin sitting on 4 acres will have you enjoying the countryside in rustic comfort. The beautiful, yellow pine interior has 2 bedrooms, a bathroom with shower, a comfortable living room area, and a fully equipped modern kitchen. The cabin will sleep 6 in two full beds and 1 full sofa sleeper. The location is away from public roads and other residential properties, offering peace and privacy for your camping experience. Whether relaxing outside on the large deck or cooling off in front of the satellite TV, you can take advantage of the many activities available on site or in town. Guests of the cabin have access to the river a short walking distance away, where they can enjoy tubing and fishing. 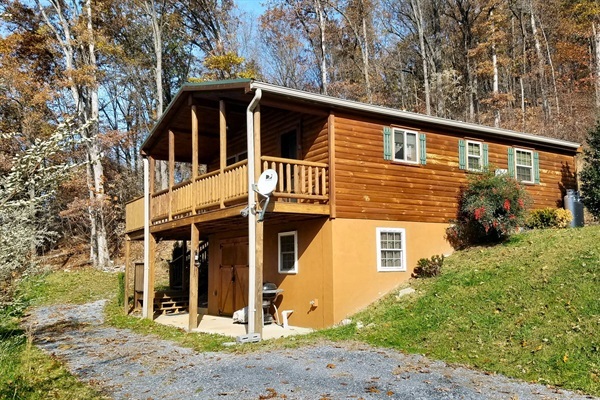 The property is 15 minutes from the historic Town of Luray and caverns, 20 minutes from Massanutten Four Seasons Resort, and 25 minutes from the Appalachian Trail and Skyline Drive. Outdoor amenities include tubes for floating down the river, covered porch, large deck, grill and fire pit. Bear Necessities is both family friendly and pet friendly, so relax and soak in the slow pace of the mountains and fresh air.